With one and the same probe the multiparameter portable measuring instrument controls up to 14 relevant parameter of water quality. 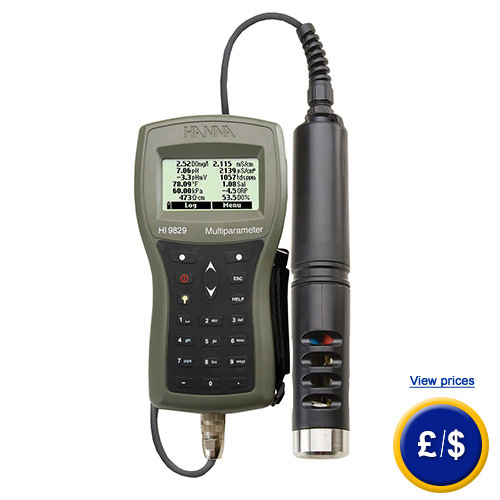 Robust and waterproofed the instrument HI 9829 was developed specially for outdoor measurements. The big lighted graphic display allows an easy handling of the multiparameter portable measuring instrument. To guarantee a long life time of the multiparameter instrument it is delivered with a maintenance kit which consists of HI 7042S electrolyte solution for the oxygen sensor, 5 pieces O-rings for the multiparameter probe and a gun oiling the O-rings. In addition to the standard probe different probes are available it is e.g. possible to measure the cloud of the water sample. Additional a autonomy probe is available, this means the probe stores and measures autonomous data in a programmable interval. So it is possible to let the multiparameter instrument unattended during the instrument measures and stores the measurements. A combination of all this features in one single probe is of course possible, too. It is also possible to equip the multiparameter instrument with a 12-channel GPS system, which enables to charge geographical coordinates worldwide with an accuracy of 10 m. The charged geographical measurements can be displayed together with the measurements or called later. This enables to measure at the same place and to compare with each other. 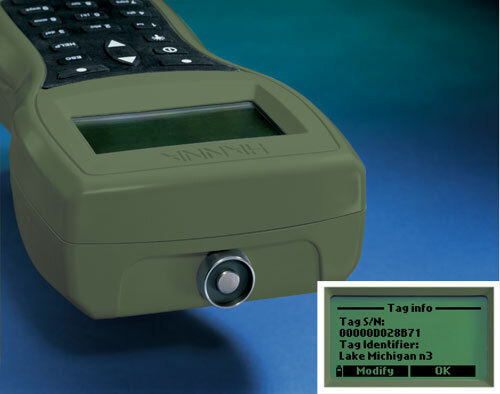 Each model commands the Hanna exclusive Tag Identification System (T.I.S.) which allows to allocate measurements also without GPS to a certain place and make them comparable. For more information please have a look to the technical specification. The mulitparameter portable measuring instrument connects high developed technique with intuitive handling and simpleness. If there are any questions about this multiparameter instrument, please have a look at the technical specification below or call: UK customers +44(0) 23 809 870 30 / US customers +1-410-387-7703.. Our engineers and technicians will gladly advise you regarding the multiparameter portable measuring instrument or any other products in terms of regulation and control, or scales and balances of PCE Instruments. All meters and probes are fully compatible with each other, and all available measurement sensors can be used on both probe models. Different combinations of meters, probes, sensors and accessories can be ordered either in predefined configurations or individually. See at accessories for ordering configurations. HI 9829 is supplied complete with your choice of probe and probe maintenance kit. This kit includes HI 7042S (electrolyte solution for DO sensor), (5) O-rings for DO sensor, a small brush, (5) O-rings for probe and a syringe with grease to lubricate the O-rings. Sensors for all meter and probe configurations are sold separately, see configurations up above. ISE Standards Kit for HI 7609829-10, 10 Sachets ea.